Cut the squash in half and remove the seeds. Cover the surface of each squash with a light layer of olive oil. Season with salt and pepper to taste, and arrange on a greased baking sheet. Bake 25-30 minutes or until the squash is cooked and tender. Heat a tablespoon of oil in a medium-sized pot. Add the onion and jalapeño and fry until the onion is soft. Add the bell pepper and cook for a few additional minutes. Add the chorizo, crumble with a spoon and stir to incorporate with the vegetables. Reduce the heat to medium and cook for 15 minutes. Add the chopped tomato to the chorizo mix, stir, cover and let cook for another 5 minutes. Once you’ve taken the pumpkin out of the oven, reduce the temperature to 325° F.
Add the croutons to the chorizo mix and season with salt and pepper to taste. Stir and cook for a few more minutes. 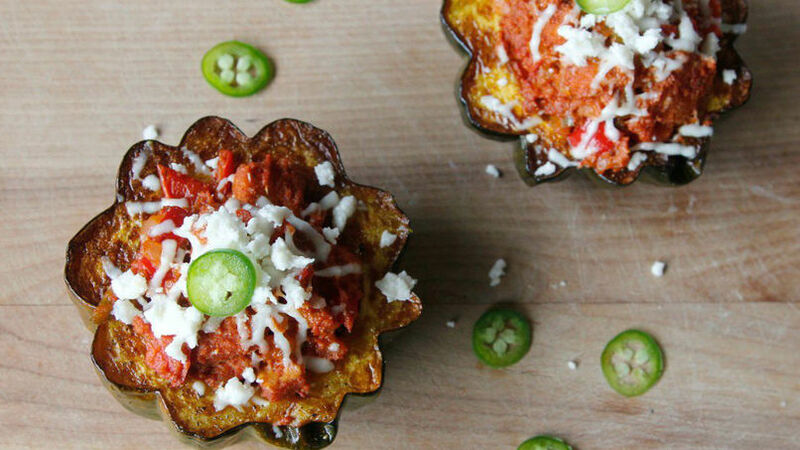 Stuff the pumpkins with the chorizo filling and cover them with crumbled queso fresco. Bake for an additional 2-3 minutes or until the cheese has melted. Remove from the oven and serve immediately with more queso fresco. Add more heat by swapping out the bell pepper for jalapeño. One of the nicest things about fall, in addition to all the beautiful autumn colors, is that it brings with it squash and pumpkin in all shapes and flavors. Definitively, the favorite in our house is the variety of pumpkin used to make pumpkin pie, but there are so many kinds of squash that you could almost prepare a different one each week. Today, for example, I bring you acorn squash. As the name suggests, it’s acorn-like in shape. The inside is a beautiful pale yellow and the flavor nice and delicate. It’s perfect for stuffing, not only because it’s so beautiful but also because the skin offers the perfect support for a filling. Chorizo a la mexicana gives this dish the perfect balance of spice and heat to balance out the perfectly mellow, delicious flavor of this squash. Also, this roasty, toasty dish is ready in just an hour. Enjoy!